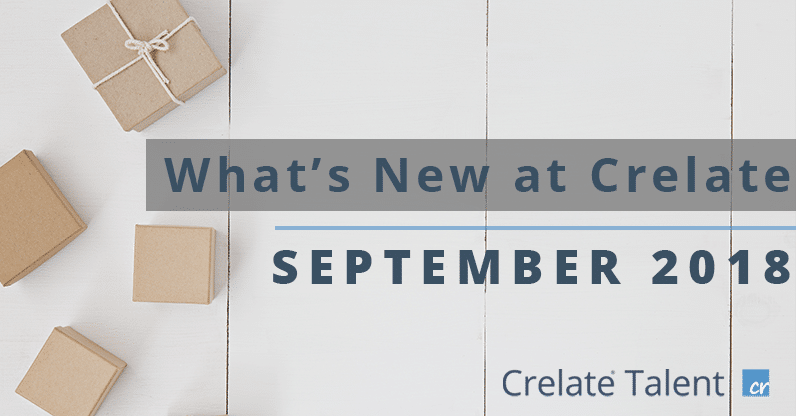 We had a productive summer at Crelate and we’re happy to share what will be included in the September product release. Crelate’s Recruiting CRM and Applicant Tracking System will receive a refreshed user interface along with more mobile texting capabilities and better engagement tracking. Please review the changes below to see what’s coming in our September 28th release. 1. User Experience Updates – We’re making small enhancements throughout the user interface to make Crelate even easier to use. This includes changes like updated icons, clearer menus with tooltips, improved search and filter, and new reporting data visualization. 2. Mobile Texting – You will be able to stay in touch with candidates on-the-go using the new Crelate Connector app for Apple and Android. 3. Engagement Tracking – We’re making it even easier to see when a candidate was last engaged and configure when and how engagement dates are updated. 4. Activity Templates Updates – Improve consistency across the hiring process with standardized templates for interview questions, phone screens, and other repeated activities. We’ve made subtle UX changes throughout the Crelate interface. We worked hard not to move anyone’s cheese, just added a little color to help make Crelate more enjoyable. We freshened up the left sidebar and added some colored icons but did not change the capabilities and information available within them. The layout of candidate records has been updated to be more distinguishable with new color coding based on the record type: green for candidate records in the ATS, orange for job opportunities and blue for company records in the CRM. We also reduced blank areas throughout Crelate so more information surfaces on the page without you needing to scroll. There are new social media icons at the top of the Candidate profile, this makes our social search capabilities front and center (they are still in the “This Candidate Menu”) and if you haven’t linked to a candidate’s social pages yet, you can click the icon to search for a contact on that social media platform. There’s an additional option to open a search engine query by clicking directly from a profile in Crelate. Our customers asked for advanced filtering functionality so there will be a new filtering experience to quickly add or remove filters based on search requirements. The reporting capabilities in Crelate will also undergo interface updates that allow for deeper chart data configuration. It’s no secret that more and more people are using mobile phones to get business done. That’s why we’re happy to introduce Crelate Connector, a messaging app available for Apple and Android phones. With the new Crelate Connector app, you can text candidates from your mobile device, and the interactions are stored in your Crelate database for future reference. You’ll also be able to add, update, and delete contact records if needed. Proactive recruiters will love the new engagement tracking capabilities in Crelate. Each contact will clearly display the last time there was an interaction through Crelate. This is important for the recruiting firms that like to engage talent with continuous outreach. It means you’ll be able to query and schedule future actions from engagement dates. For example, say you want to reach out to old clients that you haven’t heard from in 6-months, the release will allow you to easily pinpoint last interaction dates so you can nurture relationships without taking up your whole day. We’ve also added a series of new settings to let you and your users control when and how these dates are updated. Activity Templates will be especially useful for organizations looking to scale efficiently. Understanding that consistency between teams is crucial to scale rapidly, we built Activity Templates to allow you to predefine forms that your sourcers and recruiters can use throughout the recruiting process. For example, this can include interview and screening questions for your whole team to access. When your team is using the same templates for interviews it standardizes a consistent experience, so your business can reduce the chance for bias and error. Thanks for reading about the upcoming September release! Look for the updates in your Crelate account next week. We look forward to hearing your feedback because it helps us continuously improve our product. You can always check out what we’re working on by visiting our Roadmap page.